The audience scene (larger scale image appearing further down). 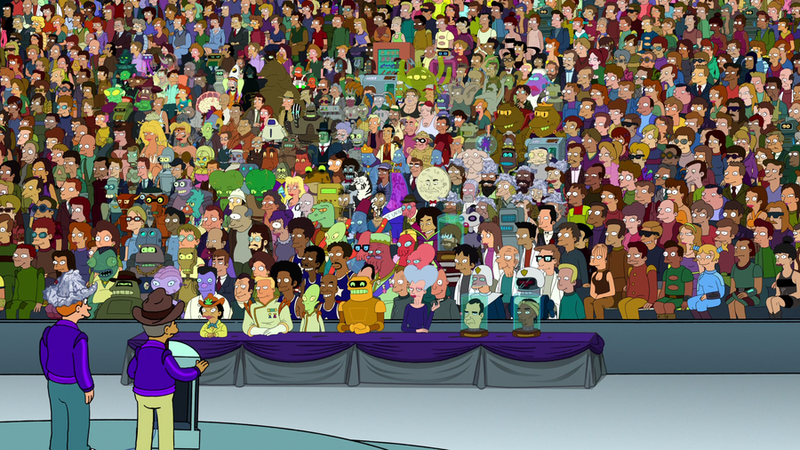 The audience scene near the end of Into the Wild Green Yonder is famous in its undertaken of the creators trying to insert all adult characters which had made an appearance on the show so far. David X. Cohen began hinting at the scene in interviews prior to the film's release. While its intention may not be entirely obvious, it may simply boil down to being a 'cool' thing to do, if this was indeed the last Futurama they ever did. 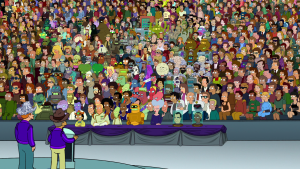 Due to the excessive amount of characters appearing in one picture, and each requiring individual drawing (since they could not simply be inserted with the "people hose"), the animation company, Rough Draft Studios, had to fine the production company, The Curiosity Company, for the extra time it had to take. This page was last edited on 23 February 2016, at 19:53.